This is the resort to stay if you want to feel like a high roller without spending like one. Perfect, reasonably priced rooms are done with botanical prints and yellow, cedar, and cranberry hues; they all have old-fashioned looking custom made work desks, and suites are decked in imported silks and hand-loomed carpets. Bathrooms have marble accents and luxurious appointments. The salon features massage therapies, beauty treatments, hydro therapies. Live entertainment includes the new performance by Cirque du Soleil: THE BEATLES LOVE; the show explores the content of the songs as interpreted by innovative performances from a cast of 60 international artists. A youthful, raw energy is channeled through aerial performance, extreme sports and urban freestyle dance. Mirage is as well home to singer-comedian Danny Gans, and touring headline entertainers. 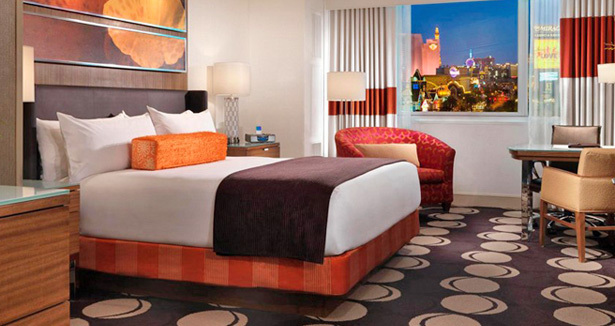 The Mirage sets a high standard for itself and for every other luxury hotel in Vegas. Its timeless beauty, tropical surroundings and exceptional service make it one of the most beloved hotels on the Las Vegas Strip.